Preview the Globalisation Case Study from 'The Change Catalyst: secrets to successful and sustainable change' by Campbell Macpherson published by Wiley. 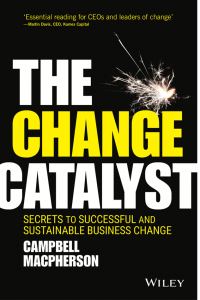 The Change Catalyst’ (secrets to successful and sustainable business change) published worldwide by Wiley. The following is an extract from one of the main case studies contained in the book. One of the most dramatic economic forces of the last half century has been globalisation. One could argue that globalisation began many centuries ago when the British, French, Dutch, Spanish and Portuguese merchant ships explored the world and expanded their trade horizons. However, the globalisation I am talking about is the most recent acceleration of this trend – fuelled by lowering of trade barriers and then the internet. How the West has coped with globalisation is one of the best examples of how not to instigate change. Lowering of trade barriers around the world, spurred on by the rapid ubiquity of the web, has produced a global market for goods and services. The increasingly free flow of capital across borders has created vast economic benefits on a global scale – and has lifted millions of people out of poverty. The world is now far more interconnected than ever before, enabling flows of information and increasing political transparency, even within some of the most despotic and undemocratic governments. I say “increased” transparency because many countries across Asia, Africa and the Middle East still have a long way to go as regimes restrict access to the internet, afraid of the dissenting views that transparency inevitably brings. But globalisation, the rise of the middle classes within the developing world, the ubiquity of the internet and cheap airfares have all served to increase transparency and the flow of information. Prices of electronic and hi-tech manufactured goods have plummeted over the last few decades whilst at the same time their quality has risen dramatically. Televisions, smart phones, PCs, laptops, tablets, solar technology, white goods … we can now enjoy incredible quality at prices that were unimaginable only a few years ago. Advancements in pharmaceuticals and medical treatments are the direct result of global competition and massive R&D spending. Thanks to the internet, research is cheaper and quicker than it has ever been, we can order goods from anywhere around the word, communicate with anyone on the planet, publish from our homes, book flights to anywhere, pay bills, bank, invest, … all without leaving our houses. Globalisation has made our lives more exciting, more interconnected and full of increasing wonder. Solar energy is now one of the cheapest energy sources thanks to the continual improvement of Chinese manufacturing. China can now produce photo-voltaic cells at a fraction of the price as Germany at the same or better quality. In 2015, Dubai went out to tender for a solar farm. By the time the contract was awarded, they were able to double the number of solar panels for the same price. In 2016, they are doubling up again. India is planning the world’s biggest solar farm and the world’s first 100% solar-powered airport. We will witness a proliferation of solar energy in the coming years – not because of the Paris climate change accord, but because solar power is cheaper than coal-produced power. And this situation is not a blip; it is set to continue. Globalisation has disrupted entire industries and entire new industries have been forged. In 2015, the performance of just four companies was equivalent to the entire gains of the S&P 500 – Facebook, Amazon, Netflix and Google. Every one of these was a humble start-up twenty years ago. Two of them have disrupted existing industries; Netflix (along with its imitators in Amazon Prime and Apple TV) has destroyed Blockbuster and an entire video industry) and Amazon has changed the entire landscape of retailing across the Western world as all but the best prime location shopping malls and department stores are struggling to be commercially successful. Globalisation has indeed changed the world. However, common to many change initiatives, the leaders responsible for driving globalisation (mainly Western corporations, governments and global institutions) seem to have forgotten to properly consider the dreaded “I” word – implications. No-one seems to have planned ahead. At the same time, globalisation has created immense wealth and vast global corporations – to the benefit of investors, pension fund shareholders, executives and successful entrepreneurs. While it has created scores of new “hi-tech” jobs and careers which did not exist a generation ago, many millions of lower-wage, under-skilled workers in developed countries have been left behind. The gap between rich and poor has expanded rapidly over the last few decades to the point where 1% of the world’s population now owns as much wealth as the bottom 50%. But wealth inequality in the world’s largest economy is even more staggering. According to the Fed’s most recent Survey of Consumer Finances, the bottom fifth of American households had a median net worth of just $6,400 in 2013. (Reports from earlier years have this figure as negative.) The next fifth had a median net worth of $27,900. Let’s be blunt; that’s not much. If we move to the top of the food chain, the median net worth of the top 10% was $3.3m. The wealth of the top 10% is more than 500 times that of the bottom 10%. But that is nothing. $3.3m may seem like a lot of money, but it is “chump change” to those at the very top of the tree (to use an Americanism that was designed perfectly for just such an occasion). The individuals listed in the 2015 Forbes 400 rich list are worth, on average, $5.8 billion. Each. The gap between the haves and the have-nots has become obscenely large. And the have-nots know it. Half a millennia ago, Sir Isaac Newton showed the world that “for every action there is an equal and opposite reaction”. The wonderful irony is that in the US the reaction of many of those displaced by globalisation has been to vote for a billionaire standing for the right wing Republican Party. But let’s be clear: The 2016 presidential election is only the beginning of this equal and opposite reaction. It is the start of the US’s “Arab Spring”. The displaced have awoken; they have found their voice; they have become angry and whilst they may be venting their anger at Muslims and Chinese and Mexicans, the real targets for their anger are establishment politicians and multinational corporations. They are unlikely to retreat back into relative silence after the election for the simple reason that, as we saw with Brexit, they have very little to lose. Change always comes at a cost. When helping clients instigate change, I advise them that they must choose whether to ‘pay now or pay later – and it always costs much more if you decide to pay later’. This mantra is just as relevant when it comes to globalisation. I am afraid we will now have to pay more. The lack of change leadership when it comes to globalisation – the lack of appreciation of the implications of the change – is now coming home to roost. In ‘Atlas Shrugged’, the elite ran away to a hidden valley to start afresh, leaving the unions and bureaucrats to drive the rest of the world into the ground. Back in the real world, the displaced are still with us – and due to the prolonged inaction of generations of Western leaders, there are a lot of them. The Change Catalyst’ available on Amazon.com, Amazon.co.uk and Booktopia.com.au.